I was hoping that this was a bad belated-April-fool joke, but no! This actually exists! It’s always the same deal when prom comes around — > kids guilt their parents into buying over-priced dresses, save up all year to hire a limo, and, of course, dream of being asked to go by the hottest guy in school. But now, you have options when it comes to the sort of corsage you get the lucky lady! I guess KFC was not content to just be a restaurant… They wanted in on the craziness that is prom! Hence, the KFC corsage!!!!!!!!! 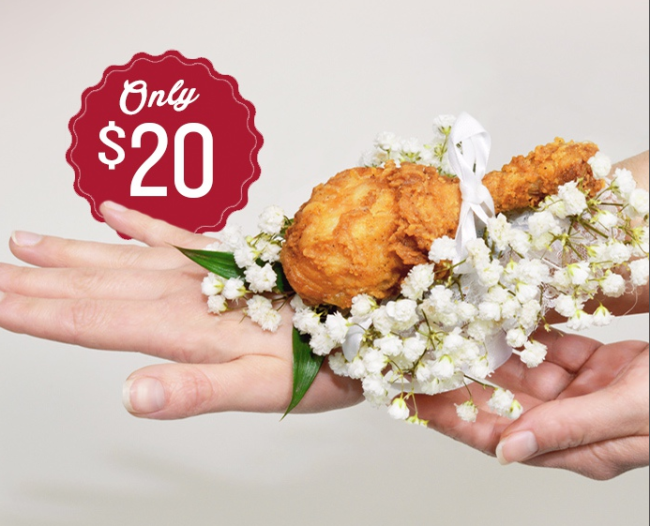 Launched in collaboration with a Kentucky-based florist, the corsage costs $20 and comprises a spray of baby’s breath and a $5 KFC voucher (due to freshness issues). Thank God, there isn’t really chicken on the wrist! World’s Toughest Job — MUST WATCH!